San Rafael Fiesta Special Church Service on Sunday morning at 10:30 a.m.
‘Viva La Fiesta’ is the joyful shout one hears at the beginning of the annual celebration in the Hispanic culture known as the fiesta. Here in San Rafael Parish, it is heard at the end of the liturgy of the Mass as the Parish proceeds with the festivities to the bazaar in the hall and Church grounds. This year the Fiesta is on Sunday, Oct. 6th, original feast day is Oct. 24th. Parishioners have been preparing for weeks for the annual event. It starts on Saturday evening with a procession down the main street leading to the Church for Vespers (evening prayer) and concludes with refreshments and sometimes fireworks. This celebration dates back to the time when a priest visited the Parish once a year. During his visit, he would administer the sacraments of Baptism, Confession, Eucharist and Marriage to all who were waiting for his visit. Reception of any sacrament has always been a reason to celebrate in the Hispanic culture. As in the past, today many parishes are without a resident pastor so parishioners organize and put on the annual Fiesta with many activities that are used for fundraising for one project or another. The statue of the Parish patron saint is carried in procession before Mass into the church, where the Eucharist is the center of worship, and from the Church to the center of the bazaar at the hall. San Rafael*, our patron, is one of the seven archangels, who stand before the throne of God and one of the three mentioned by name in scripture. Raphael’s name means ‘God heals’. He is found in the book of Tobit of which readings are taken for Vespers. This book is a ‘must read’ with all the trials the main character, Tobit, and his family are challenged with. Raphael is sent to answer the prayers of those in need of heavenly intervention. He is a patron for healing eye disease and mental illness, against nightmares; a patron for doctors, pharmacists, young people, travelers, and happy encounters. The statue in our Church depicts him holding a traveling staff and a fish, which provided the organs used for healing Tobit of his blindness. San Rafael in the Diocese of Gallup is first mentioned in Valencia County records dated Aug. 24, 1884. It was from a petition and manifest sent to Pres. Grover Cleveland asking for protection of land rights for the first settlers. After many trials, the building of the first church was completed. It was blessed by Bishop Salpointe from Santa Fe on Nov. 24, 1906. 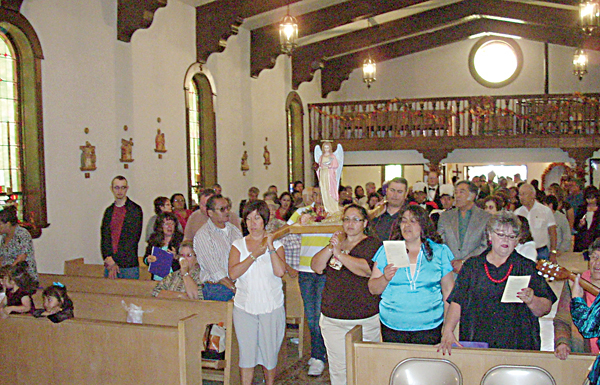 Our Parish held a centennial celebration in 2006 with the main celebrant, the late Bishop Donald Pelotte, assisted by diocesan and Franciscan priests, some former pastors. With love and generosity for their Parish Church, parishioners and other benefactors raised money to build a handicap ramp, rebuild the Grotto fence, which had been vandalized, and repaired the Church walls and roof damaged by rain and snow. With Fr. Michael Vigil now assigned to the Parish, as of Jan. 2013, parishioners continue to move forward in faith, hope and love. Faith in a loving God that provides a priest for Sunday Eucharist and other sacraments, and love for each other in community are maxims that keep the faith alive. Pray for us, San Rafael, y que ‘Viva La Fiesta’! Note:*Rafael, Spanish name for Raphael. This article appeared in the October 4 edition of the Cibola County Beacon. It is being reprinted with permission.